It was a gritty performance to say the least. Our hero was struggling with his new wet stone, trying to practice the ancient art of chisel sharpening. The problem was that the wet stone, was, well, wet. The slightest pressure on the chisel and the coefficient of friction would be great enough that the stone would move too. This angered our hero. With a head full of rage and a fair amount of walnut lying around, he set out to put an end to the torment. As some of you may know, if you have been following my feeble attempt at progressing along the path of the woodworker, that after tumbling down the rabbit hole and discovering the joy of the hand cut mortise, I ran into a rabbit. The rabbit spoke perfect English, which is unusual, and he told me that I should learn to sharpen my chisel. Naturally I turned to the World Wide Web for guidance. Some of the comments regarding the sharpening of chisels and planes were less than encouraging. Basically they went something like this. Disgruntled Woodworker: “I have been building knick and on occasion knacks for years. 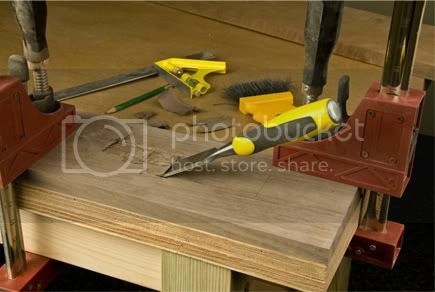 Some of those knacks require the use of a chisel. I don’t mind using it, but I would rather take a sharp stick to the eye, than try to sharpen my chisel. 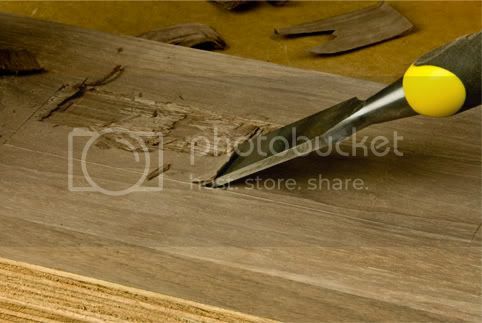 In fact, I would rather sharpen the stick.” It seemed that the general consensus is that with the exception of several Japanese monks, and a handful of woodworkers in a bunker in Maine, the job of sharpening by hand cannot be mastered. Then the articles go on to tell me how easy it is. I am definitely a glass is half full sort of person, so I figured it was possible for me to learn. I bought a small device which is designed to help get the correct angle. I also picked up a 1000 & 6000 grit King Combination Stone, the K-80S. Unlike most of my tool purchases, I did little research on this purchase and simply picked the one in the box I liked best. It had Japanese characters on it, and I knew that meant it was of high quality. I read the directions. I learned that it is important to soak it for 3 – 5 minutes before using. I learned from the articles that the monks and woodworkers from Maine keep their stones in plastic containers filled with water all the time. My small plastic bread holder got promoted to wet stone holder. It is large enough that I will be able to add an 8000 grit stone to it, once I find one in a suitably colorful box. The articles also showed how one could take a piece of glass and use sticky glue and sand paper to do something or other. I really glossed over this part because I wanted a wet stone! All the cool monks have them these days. I have now spent many hours sharpening on my wet stone. I found some old chisels in the garage. My garage is filled with a treasure trove of old tools. I have no idea what all is in there, but it seems that when I really need something, it makes itself known to me. 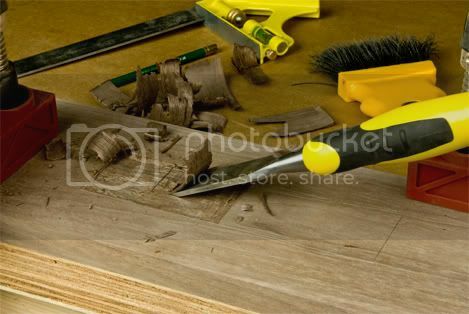 The chisels are of dubious quality, and are probably not as good as the 2 low end ones I have purchased, but they are chisels, they can be sharpened and that is good practice. I assume that the only way you can become a sharpening monk is to practice, and be able to walk the rice paper. 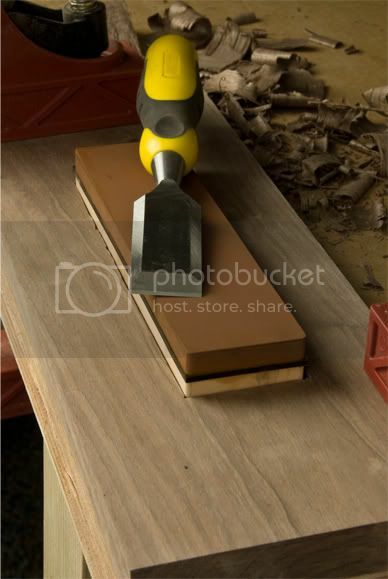 The only gripe I had with the sharpening process, which I actually didn’t mind at all, was that the stone kept moving. I have a limited skill set. 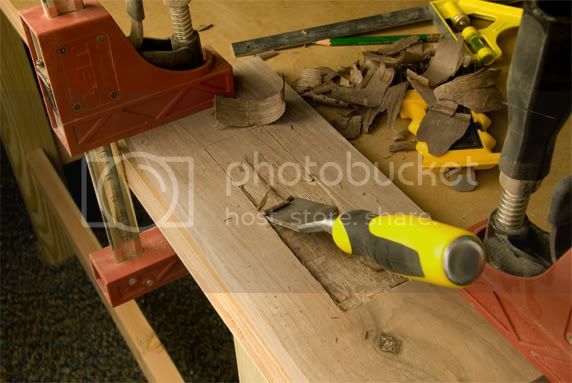 Basically I can take a piece of wood and chisel a mortise into it, or cut a tenon on the end. Fortunately for me, that is enough to do what I wanted. I took one of my 5 ft pieces of walnut, cut off 16 inches worth, sanded it to 400 grit, and drew a line on the board around my wet stone. I should mention that the other day, while at Acme Tools, I picked up another nugget of woodworking knowledge. If one sands to 400 grit, it makes applying stain nearly impossible. It was explained to me that at that grit, one is burnishing the wood. The pores become polished to the point that they won’t absorb the stain very well. I figured that burnishing the wood on my wet stone holder was a good idea. So I sanded it to within 7/8ths inch of its life. With a box drawn, I took chisel in hand and went at it. It was really fun. I feel as if I am improving every day with using the chisel. Today’s project was a tremendous exercise. I am getting braver. I am taking larger chunks out. I am controlling the chisel more. I am ending up with a cleaner result. 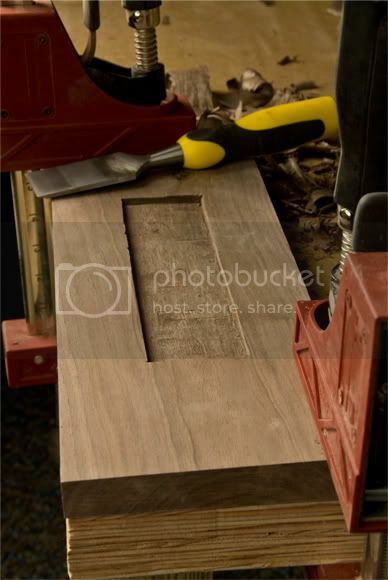 The question that I am sure many of you will have, is how many freaking words can ‘chisel boy’ write about hogging out mortises? The answer might frighten you, so I will just let you find out for yourselves. At least I did something today that could be photographed, not that you didn’t enjoy the cat photos, but I am sure that animals again today, would have been met with scorn. So in conclusion I would like to sum thing up by saying…”The End”. As always a pleasure to read! was always sent to the monk schools ? to do any actual work for years .